CIMRM 1578 - Mithraeum III. Poetovio / Pettau / Ptuj, Slovenia. 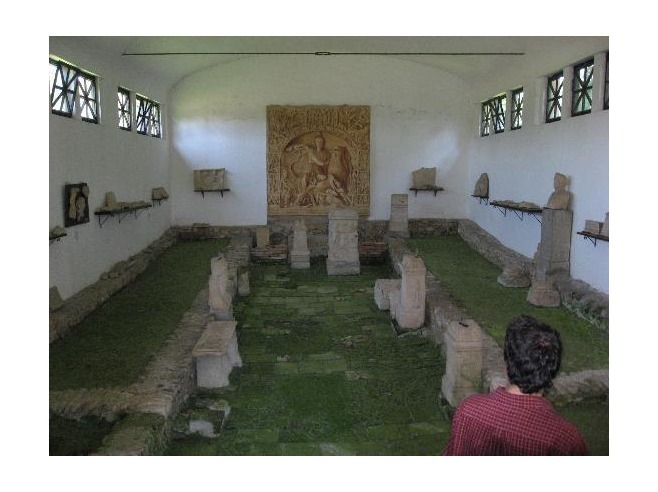 In Ptuj (Pettau) at Zborn Breg (Ober-Rann) Mithraeum III was discovered in 1913 between Roman villas which are situated between the Brunnwasser and the Pragerhoferstreet. The finds are preserved in the sanctuary. V. Skraber in Oesterreichische Illustrierte Zeitung 1914 No. 8; E. Reisch in JOAI 1913, 102ff; Saria in Blätter zur Geschichte und Heimatkunde der Alpenländer IV, 1913, 425ff; Abramic, Führer, 172ff. See fig. 399. The Mithraeum stands in an almost exact N -S direction and is situated in the immediate neighbourhood of the river Drave (Drau). It is practically certain, that on its east side there was a sanctuary of the Magna Mater (the bust and the head of a large statue of Cybele are preserved). 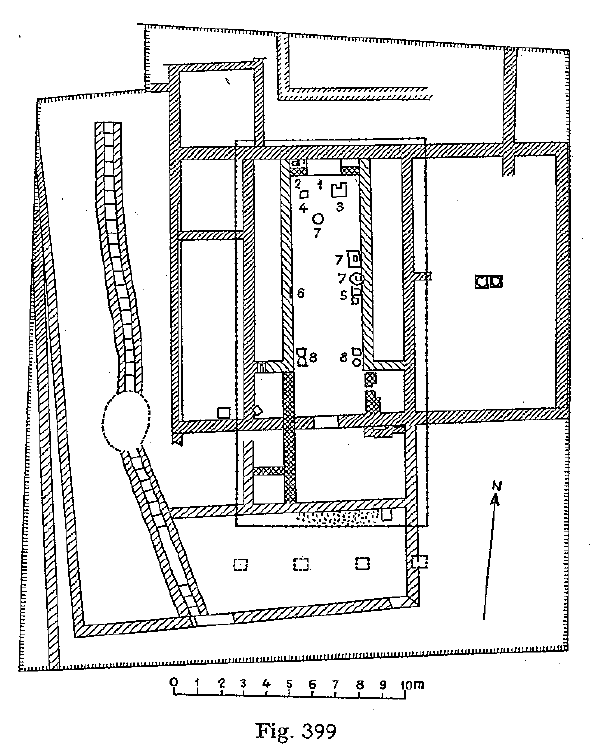 It is possible to distinguish two periods of the sanctuary: the walls of the original Mithraeum were in pebble (in the plan they are indicated by narrow crosshatched lines to the left for the outer walls and by cross-hatched lines to the right for the inner walls); the extension of the later period was in brick (in the plan the outside walls are indicated by cross-hatched lines to the left whereas the inner walls are indicated by cross-lines). On the left of the statue of Mithras as a bull killer in the floor before the niche a bollo, which I was not able to decipher). In both periods we have the normal division into a central aisle and two benches. The original sanctuary (L. 11.20 Br. 6.85) had a pronaos (Deep 3.00) which after the enlargment became part of the sanctuary proper. The left bench was enlarged to the outer wall of the former pronaos; the r. bench also was enlarged at the same time. The Mithraeum was provided with a larger pronaos. At the end of the central aisle a projecting base (L. 1.40) was made in brick for the cultrelief to stand on. It was later on enlarged to the breadth of the central aisle. On its left side there are still traces of stucco and of red painting. The Mithraeum was covered by a wooden roof as appears from fragments of loam with basket-work. The side walls were painted in a simple way (white bordered with red rims).